Hi everyone. I'm hoping that you can send my little Meadow some good thoughts/prayers. She has "gone down in the back". That's dachshund speak for exhibiting signs of IVDD - a disk problem that is common with my little loves and other long-bodied dogs. Wednesday my parents came over to visit and she kind of slid off the couch. No injury - but I think that's what ultimately sparked the IVDD. An hour or so later, she had one stumble step and quickly recovered. At midnight potty time, she started going downhill quickly. I rushed her to the vet around 3:30- 4 o'clock. We're home and on "crate rest". However, Meadow HATES the crate, so I'm holding her at all times. Hopefully, with the cocktail of medications that she's been put on and me as her personal pillow, she'll be back to normal soon. Hug your pups (and kittehs) for me! awww....praying!! I am sure you are worried to death! !I know I would be so stressed...hoping for a quick recovery and calming thoughts! Aw sending lots of prayers for Meadow! We are purring for Meadow. Awwww poor sweetheart. 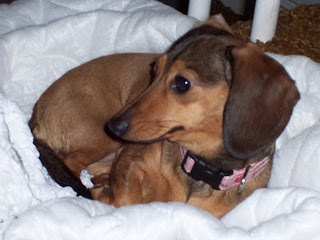 My princess (mini dachshund) is 14 and has had some problems off and on, has pretty bad eyesight now, but is still my little love. Lots of prayers for sweet Meadow. Praying for Meadow. Those little ones have us so wrapped up in love with them. I'm sending good thoughts Meadows way! If things do start to go downhill (and hopefully they won't) email me. A good friend has a weenie with this disorder... they've done the surgery, the therapy, and pretty much have Penny's care down to a science so she can live as normal of a life as possible. I think they could be a great resource! Poor Meadow! I hope she gets to feeling better soon. So, so sorry to hear that. Please keep us updated on her progress. Oh no!!! I'm so so sorry! And so sorry I missed this. Have you gotten one of those pet slings for her so you can do stuff around the house without having to put her in the crate? That's what my friend's Doxie who's back went down did. Have you considered hydrotherapy for when she's more recovered? Hugs to you and the pups! Saying prayers. Keep us updated! Omg I'm so sorry to hear about this!! How's she doing today? I really hope she gets better and SOON!! Text me if you need to. I'm here! Oh sweetie, you guys are in my thoughts and prayers. Love to the little one. Get better soon, Meadow! So sorry to hear about this. Hope she's doing better soon. I'm sorry I'm so far behind on blogs. I hope your little Meadow is doing better!